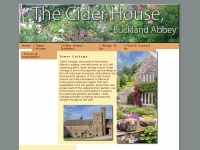 Cider House is a luxury bed and breakfast set in the heart of the Buckland Abbey Estate in Devon, which offers stunning surroundings, and a 5 star experience with the truly personal touch of a family run luxury bed and breakfast. Special offers available. Call us on 01822 259062. The web server with the IP-address 85.233.160.139 used by Cider-house.co.uk is run by Namesco Hosting THE and is located in Great Britain. There are many websites run by this web server. The operator uses this server for many hosting clients. In total there are at least 973 websites on this server. The language of these websites is mostly english. The HTML pages were created with the latest standard HTML 5. The website does not specify details about the inclusion of its content in search engines. For this reason the content will be included by search engines. The homepage of the website is "/index.php".